This small Seattle neighborhood is experiencing big changes. Licton Springs is looking to become even more well prepared for the urban demands of being a < 14 minute light rail ride from downtown. It already has relatively high side-walk coverage and population density for the North Seattle area. It is also full of pro-growth and housing community groups - with no noticeable Nimby presence. 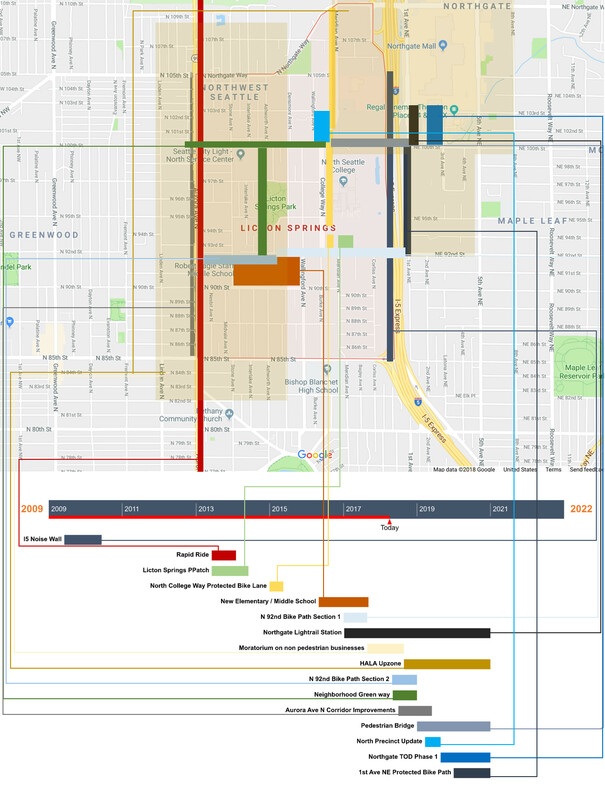 And, with the light rail approaching in a few more years, it appears the community will be well positioned to take on the growth it desires. The neighbourhood has been seeing additional improvements planned and completed at an unprecedented pace. It's hard just to keep track of all the projects going on! To try and make it a bit easier: I've gone ahead and taken inventory of all the projects I'm aware of and mapped them out by location, start time, and end time. Did I miss anything? If so, please let me know in a comment below. In any case, we certainly have an exciting few years to look forward to!